Amy Schumer’s latest stand-up special Growing shows us a different side of the comic. She is incredibly vulnerable, and of course funny, with how she discusses her difficult pregnancy and struggles with hyperemesis gravidarum. But she also gets real about being married and spends a large portion of the special telling stories about her husband Chris Fischer’s recent autism diagnosis. In the special, she explains that many of the things that put her husband on the autism spectrum (his inability to lie, for example) are what made her fall in love with him in the first place. 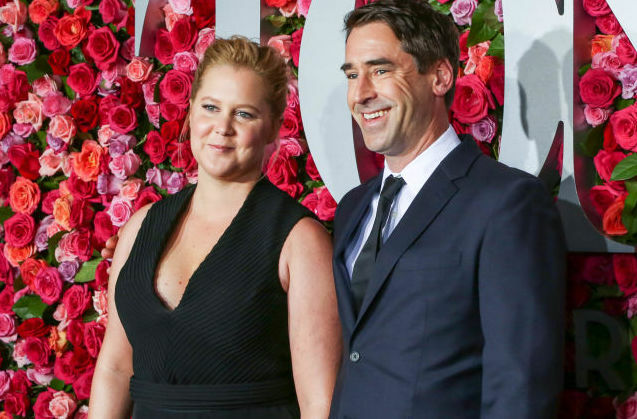 Like any comedian, she sources her own life for jokes, and although Schumer’s tales of living with her husband are funny, they are also completely endearing. Schumer appeared on Late Night with Seth Meyers on Wednesday, March 20th, and during the interview said she hoped that by opening up about her marriage and her husband’s diagnosis, she can help people see that an autism diagnosis isn’t necessarily negative. "We both wanted to talk about it because it's been totally positive," Schumer said. "I think some people resist getting diagnosed because of the stigma that comes along with it, but the tools we've been given have made his life so much better and our marriage and our life so much more manageable." "I just wanted to encourage people to not be afraid of that stigma," Schumer added. "I think a lot of people with autism go undiagnosed when I think their life could be better if they got those tools." Schumer’s special Growing is currently streaming on Netflix.